"Skin and Bones" refers to the varied expressions of building structure and the possibilities they offer for the experience of interior space. Among the projects presented in this Archive Gallery, "skin" describes buildings which conceal their structure, such as the Willis Faber and Dumas headquarters and Sainsbury Centre for Visual Arts. Alternately, the HKSBC tower and Renault Distribution Centre, for instance, clearly externally articulate their structural "bones." The ribbed aluminium skin of the Fred Olsen Passenger Terminal defines an interior which dissolves the distinction between wall and ceiling, window and skylight. Instead, the curved section creates a continuous tubular passageway punctuated by transparent bands that act as skylights and windows onto the docks beyond. These passageways are raised above the cargo activity of the docks below, separating passengers from the other commercial and industrial aspects of the wharf. 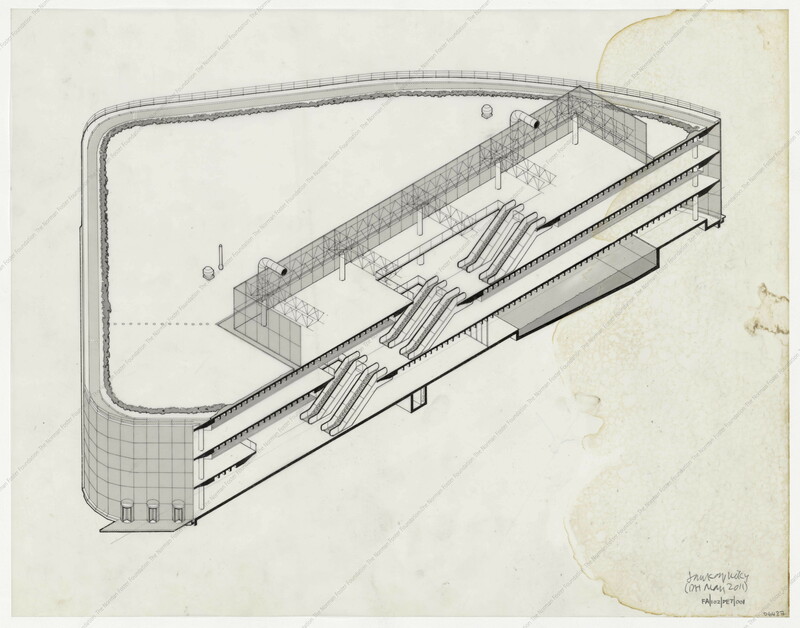 Through its emphasis on clarifying and refining the navigational and formal aspects of travel infrastructure, the Passenger Terminal reflects many of the fundamental principles to be later developed and realised in Norman Foster's airport designs. On the other hand, the sketches for the Willis Faber and Dumas headquarters reveal the process of transforming a basic square volume into a building that enters into a relationship with the city fabric by shaping itself according to the contours of Ipswich's streets. 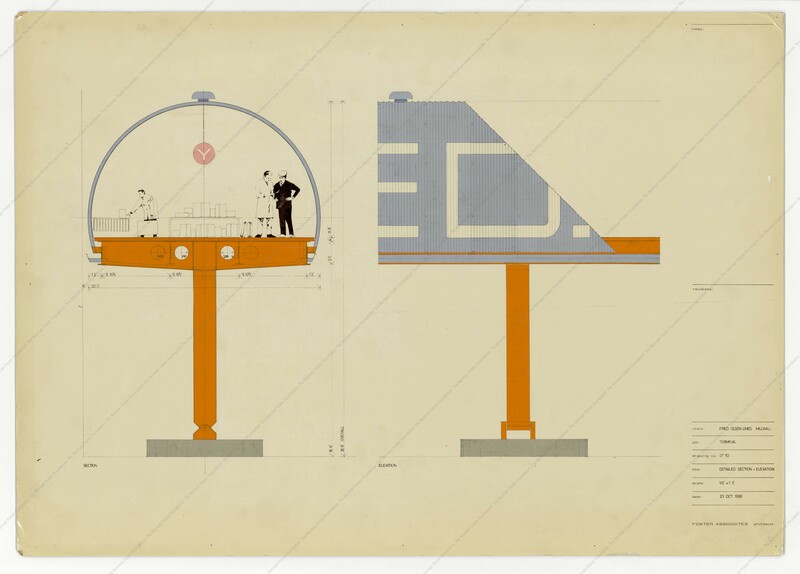 The open plan floors developed in the process drawings and sectional models mark an early revolution in the design of contemporary workplaces. The resulting spaces are not only functionally flexible, but also insist on an integrated workplace that dissolves the hierarchies between various employees. As part of this vibrant, convivial workplace, the building creates distinctive communal space anchored by a central atrium connecting the open plan floors. As seen in the sectional process drawings and model, this atrium introduces natural light to the heart of the building and leads to the green patio on the building's roof. 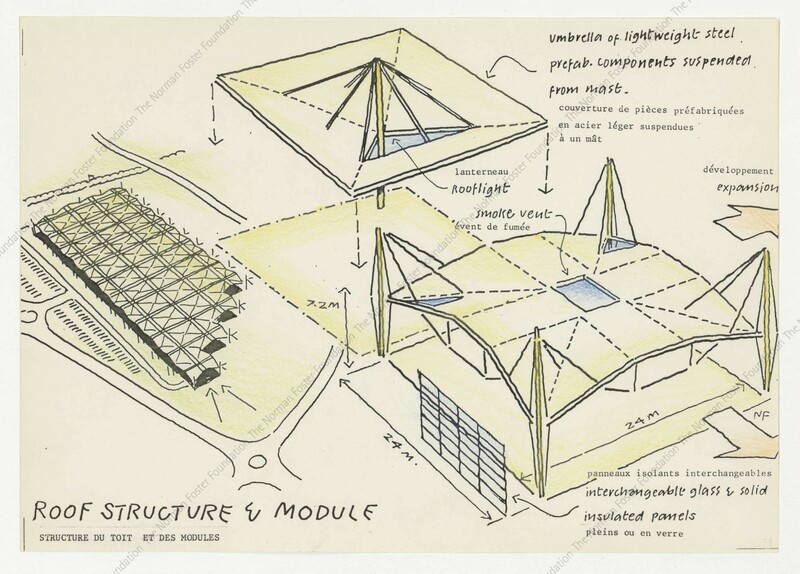 The advances for a new workplace typology made by the Willis Faber and Dumas thereby reflect many aspects of the vision of the Climatroffice collaboration with Buckminster Fuller while anticipating the ecological high rises realised by Norman Foster beginning in the early 1990s. A great example of this "Skin and Bones" analogy is the Sainsburys Centre. 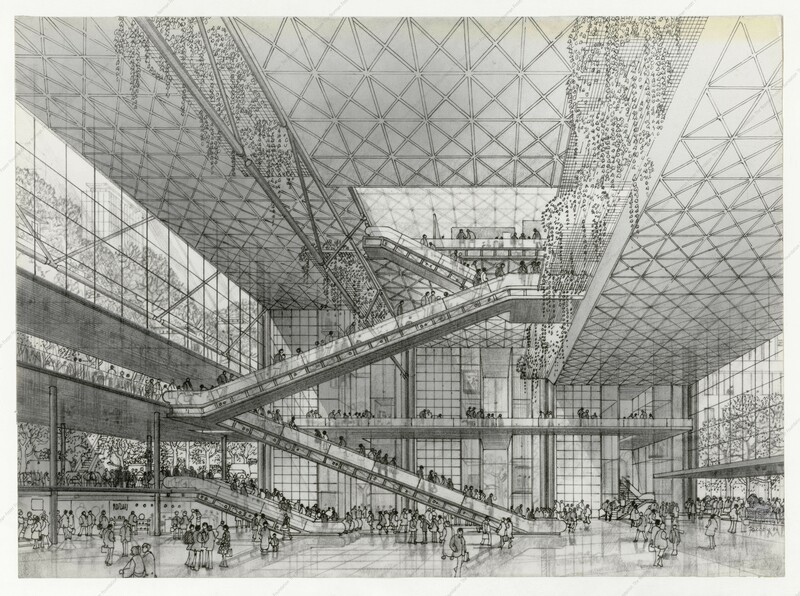 As seen in its sectional model and perspectival section drawing, the Sainsbury Centre creates a highly functional skin by placing all service elements in the space between its trusses. The original cladding system of the Centre's 'skin' consisted of a system of aluminium and high-insulation-value foam panels. This lightweight modular system allowed for easy exchange between translucent and solid panels according to changing interior needs and could be reinstalled by two people within five minutes given its light weight. The functional skin further enabled the flexible, unobstructed interior seen in the full model which easily accommodates expanded artistic practices and changing exhibition configurations. When visiting the site of the Sainsbury Centre, Buckminster Fuller notably posed a pivotal question to Norman Foster: 'How much does your building weigh?' 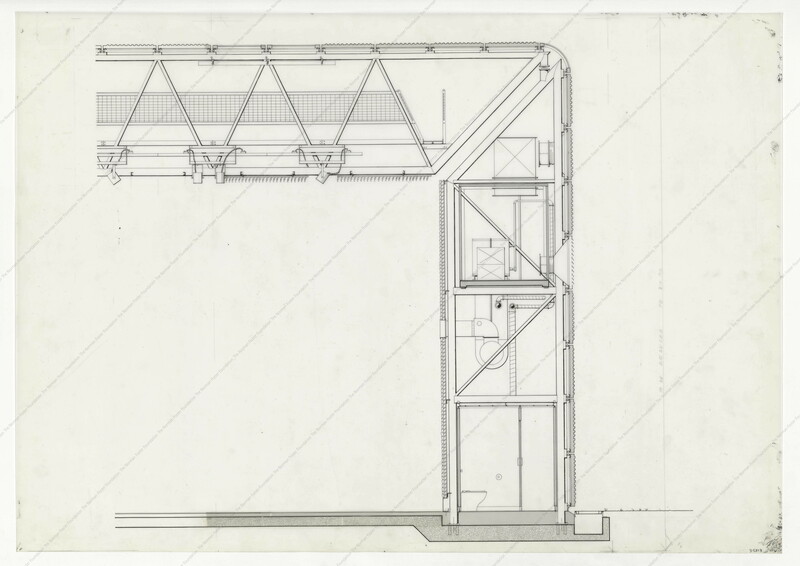 Fuller's questioning led to the revelation that the majority of the building's weight was traced to its foundation, leading to new consideration of how to optimise the building's performance and reduce structural waste. The HKSBC tower continues the development of flexible workplace floors by placing all service systems in the four vertical cores articulated in the model's elevation. The scale fragment of the vertical spine attests to the ways in which the structure externally articulates the height of each floor as well as the two-story height of each green terrace. Several massing and structural possibilities are explored in the project's process models before arriving at key concepts such as grouping office floor modules around atria and creating an open ground-floor public plaza by lifting the banking hall to the third floor. Light is directed into the tower's central atrium by a motorised reflective foil articulated on the building's south elevation which moves to follow the course of the sun. The scale fragment of the vertical spine demonstrates the way in which the structure externally articulates the height of each floor as well as the two-story height of each green terrace. The modular bay of the Renault Distribution Centre attests to a structure designed to meet mixed programmatic needs and a tight construction schedule. By using a prefabricated kit of structural parts delivered and then assembled on site, the Renault Centre was completed in just two years and thereby prefigures important construction methods used in later projects such as the Beijing Capital Airport. The Renault structure, with its roof suspended from masts, allows for individual modules much taller and larger than conventional spans. The result of this structural ingenuity, then, is not only an iconic roofline that provides natural light, but a highly flexible interior space that accommodates offices, warehouse, and gallery space under a single envelope.